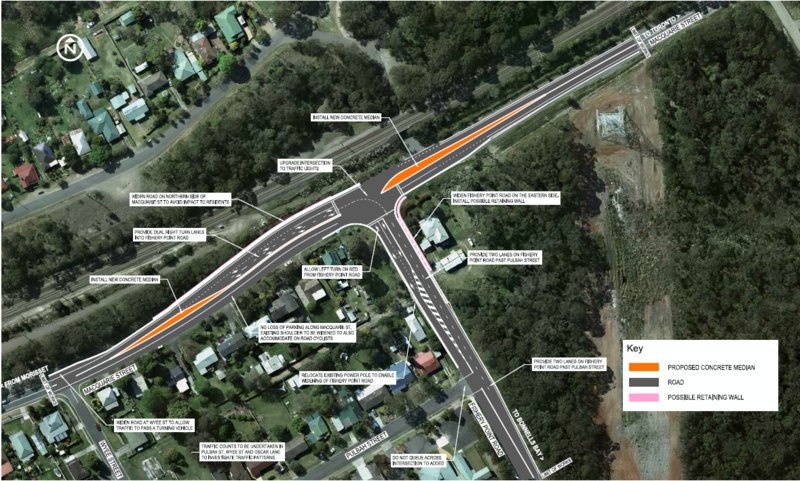 Work to upgrade the intersection of Macquarie Street and Fishery Point Road at Morisset will start next week. The NSW Government will spend $3.3 million upgrading the intersection with traffic lights in response to growing community concern and increased traffic created by new developments in the area. Roads and Maritime Services will install traffic lights for motorists turning left and right onto Macquarie Street from Fishery Point Road and for motorists turning left and right from Macquarie Street into Fishery Point Road. More than 3700 vehicles use this busy intersection in the morning and afternoon peaks alone and this upgrade will help them turn safely and reduce the risk of crashes. Work will also involve widening the northern side of Macquarie Street to retain parking for residents and providing a new on-road cycleway, as well as moving line marking at the intersection of Macquarie Street and Wyee Street to allow through-traffic to pass right-turning vehicles. A concrete median and new line marking will be installed on Macquarie Street to provide dual right turn lanes into Fishery Point Road. Dual lanes merging near Pulbah Street will be provided in Fishery Point Road, allowing enough width for through-traffic to pass right-turning vehicles, and ‘Keep Clear’ line marking will be added along Pulbah Street northbound. Work will start next Tuesday August 28 and take about five months to complete. It will be carried out between 7am and 6pm weekdays and 8am and 1pm on Saturdays. Motorists should drive to the conditions and follow the directions of signs and traffic control.